Arrange slides in this area to tell your story. Add slides and audio by dragging images, movies, audio, or snippet files from the media browsers in the Sidebar or any Finder folder to the Storyboard. Drag and drop slides to re-arrange the sequence. Switch to the Timeline view to fine-tune the timing by adjusting the duration of slides or transitions. Use the audio waveform or audio markers in the Timeline view to precisely synchronize the slides to the music. When a single slide is selected in the Storyboard or Timeline, the Stage displays the layers of the selected slide. Here the layers can be positioned, zoomed, and rotated. 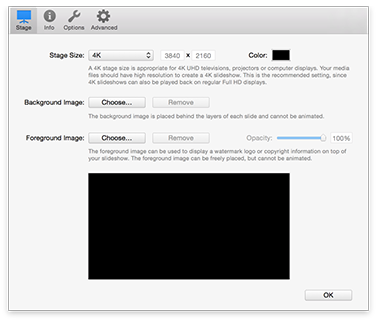 If animation is enabled for this slide, the layers are displayed twice: the start of the animation is displayed on the left side, and the finish of the animation is displayed on the right side of the Stage. The Sidebar holds the Snippet, Image, Movie, and Audio browsers, as well as the Options Inspector. The Snippets Browser contains pre-built components that can be dragged in to the Storyboard to build a slideshow quickly. The Image Browser provides convenient access to your Photos, Aperture, and Lightroom libraries. The Movie Browser provides access to movies and video clips from various sources on your computer. The Audio Browser provides access to the songs in your iTunes Library and sound effects from iLife applications. The Options Inspector contains the options that allow you to control various aspects of the slides that are selected in the Storyboard/Timeline. The toolbar contains buttons for commonly used features. On the left side are the Storyboard, Timeline, Blank Slide, and Add Title buttons. In the middle are the Playback and Share buttons. On the right side are the buttons to show or hide the Snippets, Images, Movies, Audio browsers, and the Options Inspector. 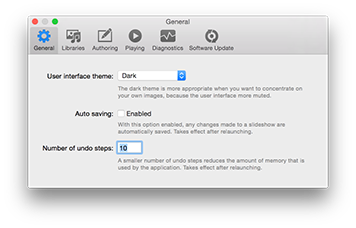 The Slideshow Settings sheet contains parameters that apply to a single slideshow, i.e. stage size, background color, a foreground (watermark) image, and more. 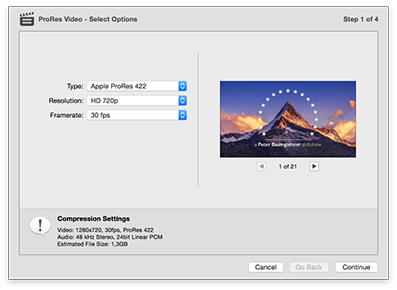 The Settings also contain metadata information about the slideshow and its author. Open the sheet by selecting Settings... from the Slideshow menu. 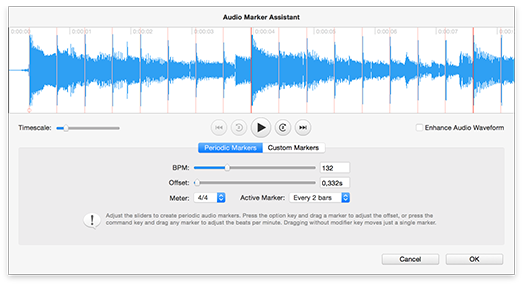 The Audio Marker Assistant helps to quickly create audio markers for synchronizing your slides with music. Open the assistant by selecting Audio Marker Assistant... from the Slideshow menu. The Sharing Assistants helps you share your finished slideshow with others in a variety of formats. Select an option from the Share menu or click the Play Fullscreen/Share button. 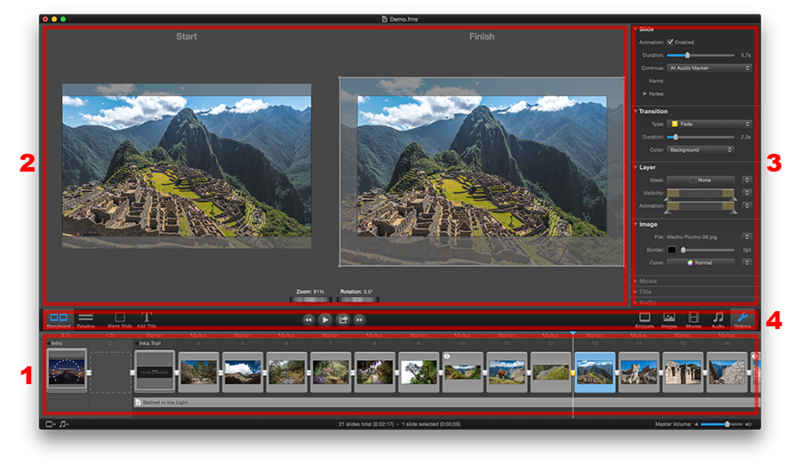 The Preferences window contains parameters that apply to FotoMagico as a whole. Open the window by selecting Preferences... from the FotoMagico menu.